A powerful broad theme, driven by nervous, throbbing chains of semiquavers (16th notes) in the piano and a vigorously bowed cello which sings out its melody with a bitter-sweet tone – if every chamber-music work began so invitingly as Mendelssohn’s D major Cello Sonata, then the number of fans of works for small ensemble would rapidly increase. The dedicatee Count Wielhorsky, an excellent amateur cellist, must surely have revelled in this closely-knit work with its waft of salon air. 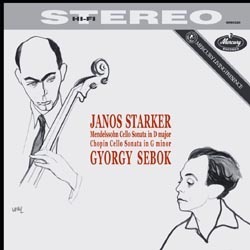 Although it is somewhat astonishing that Mendelssohn’s Cello Sonata is left unmentioned in some music handbooks, this is soon forgotten when one listens to Janos Starker and György Sebök playing the work so resolutely and with such refreshing vitality. Chopin’s Cello Sonata too undeservedly remains in the shadows thrown by his great piano concertos. Here again, the two musicians prove that they are a perfectly balanced team who complement one another admirably. 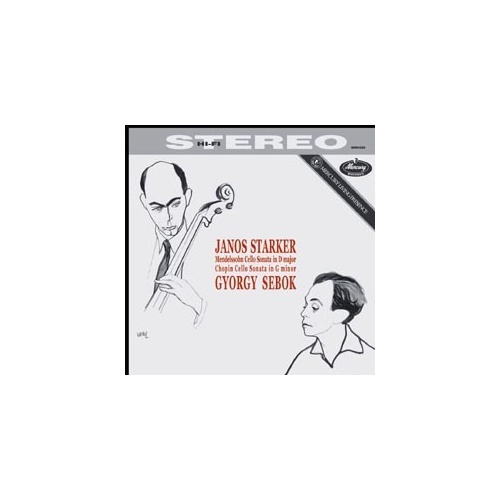 Their lightning-swift interchanges between intimate, introvert expression and nervous passion, spiralling upwards to the cello’s most dramatic top register, are characteristic for the playing of this world-class virtuoso duo who here present a remarkable recording of two rarely performed masterpieces.